Find out where your company stands with the Disability Employment Tracker™. This free and confidential assessment provides essential data to benchmark your company’s performance in disability and veterans inclusion. 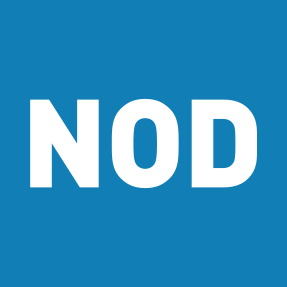 DEADLINE EXTENDED TO MARCH 15th: Complete the online assessment to receive a free benchmarking Scorecard and qualify for the 2019 NOD Leading Disability Employer Seal. Plus, completion of the Tracker is a requirement to be eligible for the annual DiversityInc Top 50 Companies for Diversity (deadline closed on March 1, 2019). The 2019 Disability Employment Tracker™ is now open! Complete this webform to gain instant access. 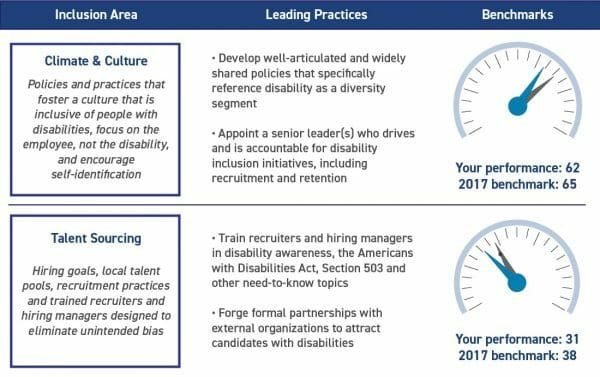 Measure your performance in six key inclusion aspects: Climate & Culture; Talent Sourcing; People Practices; Workplace & Technology; Strategy & Metrics; and Veterans Employment (optional). Compare your results to the group benchmark for each inclusion aspect. Track your progress year-over-year, by enrolling annually. Demonstrate that you are taking tangible steps toward meeting Labor Department employment targets for federal contractors. Even more, your company will receive information on leading practices, high-level trends and demographic data drawn from all participating companies. View all the 2018 Tracker benchmarks. Put your Disability Employment Tracker™ Scorecard to work. Opt for the Disability Inclusion Accelerator™, and NOD’s disability employment experts will use your company’s results to chart a plan to progress further. Your company will receive extensive benchmarking data, short-, medium- and long-term actions to advance your inclusion initiatives, and a playbook to gain internal buy-in. For more information on the Disability Employment Tracker™ and the Disability Inclusion Accelerator™, contact us at tracker@NOD.org.